Who really designed the Roosevelt Dime? Was it the U. S. Mint’s Chief Engraver, John Ray Sinnock, whose initials appear on the coins first minted in 1946, or was it sculptor Selma Burke, whose bas-relief submitted as a gift to the President five years earlier bears an uncanny resemblance to the portrait actually used? This nagging question has been raised repeatedly during recent years, and it remains a subject of debate among numismatic scholars. What is known for certain is that the American public in 1945 was clamoring for some memorial to their fallen leader, whose passing had come just as he was about to enjoy a sweet victory after years of struggle and worry. As World War II was nearing its end in April of that year, Franklin Delano Roosevelt breathed his last, and the free world mourned. The nation’s only four-term president died at 63, aged beyond his years by twin burdens of the greatest economic depression in the nation’s history and the most devastating war of all time. Within the Treasury Department, plans were quickly laid for the introduction of a new coin to honor Roosevelt. Since the late president had been afflicted with polio, or infantile paralysis as it was then commonly known, it seemed only natural to place his portrait on the dime. This humble coin was symbolic of the struggle to end polio through the “March of Dimes” fundraising campaign, a project begun during Roosevelt’s first term. In a break with its 40-year tradition of enlisting outside artists in the design of new coins, the Mint assigned this task to Chief Engraver Sinnock. His initial models were submitted to the federal Commission of Fine Arts by Acting Mint Director Leland Howard on October 12, 1945. The Commission rejected them on very specific grounds and recommended an invitational competition for the design of the new dime, naming five accomplished sculptors as candidates. Given the allowable time frame (the coins had to be ready for issue when the 1946 March of Dimes campaign kicked off on the late president’s birthday, January 30), this suggestion was quickly rejected by Mint Director Nellie Tayloe Ross. Instead, Sinnock went back to his workshop to make the desired improvements. His small head of Roosevelt with large mottos was replaced by the now familiar, larger portrait with a miniscule IN GOD WE TRUST. As it fit the available space, LIBERTY remained in large letters but was moved to the left from its former position directly above the portrait. The date, and Sinnock’s initials JS, were quite small and appeared below the truncation of Roosevelt’s neck. The reverse featured an upright torch, symbolizing freedom, flanked by branches of olive and oak, respectively denoting peace and victory. The motto E PLURIBUS UNUM was awkwardly spaced between these elements in a single line. UNITED STATES OF AMERICA and ONE DIME were arranged in arcs around the periphery, separated from one another by ornamental dots. At the eleventh hour, these revised models were approved on January 8, 1946 by the Commission of Fine Arts and Treasury Secretary Fred Vinson. Accompanying this announcement was an order from Director Ross to commence the production of hubs and dies immediately and to begin coinage as soon as possible. As they would decades later with the claims raised by Selma Burke, John Sinnock’s initials JS on the dime provided controversy from the outset. Americans, newly awakened to the post-war threat posed by the Soviet Union, were beginning to imagine Communists behind every tree. A persistent rumor spread that the initials JS were those of Soviet leader Joseph Stalin. As absurd as this may seem today, enough Americans were alarmed by the possibility of Communist influence that the Mint was forced to issue a statement identifying the coin’s creator and refuting the claims of “Reds” being harbored within its venerable walls. Coined by the millions every year from 1946 onward, the Roosevelt Dime series has no rare dates, and the only challenge in completing a collection lies in locating scarce varieties or condition rarities. A number of minor hub changes have occurred, the first appearing in 1946 when it was realized that parts of the obverse design were indistinct, including the controversial initials JS. Other modifications are noted during 1964 and 1981. Since then, new hubs have been introduced frequently. This is to compensate for the wear which results from the repeated die sinkings required to meet modern demands for additional coinage. These new hubs appear almost annually, but the changes are so slight as to go unnoticed except by specialists. Roosevelt dimes have been coined at three mints: Philadelphia, Denver and San Francisco. From 1946 through 1964, the mintmark location was just to the left of the base of the torch. From 1968 onward, mintmarks appear above the date. Those struck in Philadelphia carried no mintmark until a letter P was introduced beginning in 1980. 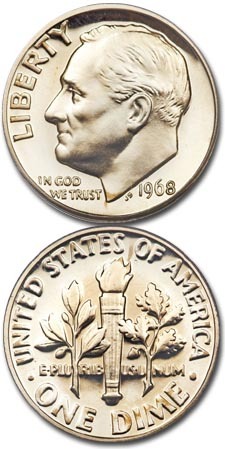 Roosevelt dimes coined at the mints in Denver and San Francisco have always been identified by letters D and S, respectively, except during the years 1965-67 when these mintmarks were omitted. All three mints made dimes for circulation through 1955; in March of that year, San Francisco ceased the minting of coins, and for the next ten years its mint was used exclusively as an assay office. The other two mints continued alone until 1965, when the West Coast facility was reactivated in an effort to overcome a nationwide coin shortage. Silver dimes dated 1964 and carrying no mintmark were struck in San Francisco during the last months of 1965. Although there are no rare dates in the Roosevelt dime series and it is easily completed in mint state, several issues carry notable premiums, particularly in grades MS-65 and higher. These include all of the 1948 and 1949 dimes, 1950-S and 1951-S. Despite their much lower than normal mintages, the three issues dated 1955 were widely hoarded and carry only modest premiums. The only regular-issue coin worth more than its silver bullion value in circulated grades is 1949-S. Points to check for wear on the Roosevelt dime include the highpoints of FDR’s hair and cheek and the flame and horizontal bands of the torch. Proofs were coined at the Philadelphia Mint beginning in 1950, and this date through 1955 are all worth more than subsequent proofs. Coinage of proofs was suspended with the adoption of copper-nickel clad dimes in 1965. No proofs were coined with the dates 1965, 1966 and 1967, but “special mint sets” were coined at the San Francisco Mint that have a prooflike quality to their surfaces. These are not as boldly struck as true proofs. In addition, less care was taken in their handling, and they frequently display nicks and abrasion, even when found in their original packaging. Proof coinage resumed in 1968, this time at the San Francisco Mint. The S-Mint dimes dated 1968 to date are true proofs bearing the letter S and were made exclusively for sale to collectors. Since 1992, these have been coined in both the conventional clad composition and at the old silver standard. The Philadelphia and Denver Mints continue to produce copper-nickel clad dimes for general circulation.